Pest monitoring Potato beetle populations initially are aggregated but tend to disperse over time. Plants can withstand considerable defoliation without yield loss (up to 30% of their foliage). Generally, insecticides do not need to be applied unless there is more than an average of one beetle or larva per plant. acetamiprid (Assail 30SG) at 0.028 to 0.047 lb ai/a. PHI 7 days. REI 12 hr. Retreatment interval 7 days. Do not exceed 0.3 lb ai/a per season. Limit four applications per season. bifenthrin /avermectin (Athena) at 0.05 to 0.12 lb ai/a. PHI 7 days. REI 12 hr. Retreatment interval 10 days. Do not exceed 0.056 lb ai/a avermectin or 0.4 lb ai/a bifenthrin per season. carbaryl (Sevin 4F) at 1 to 2 lb ai/a. PHI 3 days. REI 12 hr. Retreatment interval 7 days. Limit 7 treatments per year. Do not exceed 8 lb ai/a per year. chlorantraniliprole (Coragen) at 0.045 to 0.098 lb ai/a via drip irrigation or as foliar. PHI 1 day. REI 4 hr. Retreatment interval 5 days for foliar and 10 days for chemigation. Do not exceed 0.2 lb ai/a per season. Limit 4 treatments. chlorantraniliprole/thiamethoxam (Voliam Flexi) at 0.1 to 0.175 lb ai/a. PHI 1 day. REI 12 hr. Minimum of 5 days between applications. Do not exceed 0.172 lb ai of thiamethoxam or 0.2 lb ai of chlorantraniliprole per acre per growing season. cryolite (Kryocide) at 7.7 to 15.4 lb ai/a. PHI 14 days. REI 12 hr. Retreatment interval 7 days. Do not exceed 64 lb ai/a per season. esfenvalerate (Asana XL) at 0.03 to 0.05 lb ai/a. PHI 7 days. REI 12 hr. Do not exceed 0.35 lb ai/a per season. Retreatment interval 7 days. flupyradifurone (Sivanto 200SL) at 0.14 to 0.18 lb ai/a. PHI 1 day foliar. REI 4 hr. Retreatment interval 7 days. Do not exceed 0.365 lb ai/a per season. GS-omega/kappa-Hxtx-Hv1a (Spear Biological Insecticide) at 0.2 to 0.8 lb ai/a. PHI 0 day. REI 4 hr. imidacloprid (Admire Pro) at 0.25 to 0.38 lb ai/a soil and 0.047 to 0.079 lb ai/a foliar. PHI 0 days foliar; 21 days soil. REI 12 hr. Do not exceed 0.24 lb ai/a foliar or 0.38 lb ai/a soil per season. Foliar retreatment interval 5 days. novaluron (Rimon) at 0.058 to 0.078 lb ai/a. PHI 1 day. REI 12 hr. Do not exceed 0.233 lb ai/a per season. Retreatment interval 7 days. permethrin (Loveland Permethrin) at 0.15 lb ai/a. PHI 3 days. REI 12 hr. Retreatment interval 7 days. Do not exceed 0.6 lb ai/a per season. spinetoram (Radiant SC) at 0.039 to 0.078 lb ai/a. PHI 1 day. REI 4 hr. Retreatment interval 4 days. Do not exceed 0.266 lb ai/a per season. Limit 6 treatments per year. spinosad (Success, Entrust SC) at 0.047 to 0.094 lb ai/a. PHI 1 day. REI 4 hr. Do not exceed three applications in any 21-day period. Do not exceed 0.45 lb ai/a per crop. Entrust SC is OMRI-listed for organic use. thiamethoxam/chlorantraniliprole (Durivo) at 0.195 to 0.257 lb ai/a. PHI 30 days. REI 12 hr. Do not exceed 0.257 lb ai/a of Durivo or 0.172 lb ai of thiamethoxam-containing products or 0.2 lb ai of chlorantraniliprole-containing products per acre per growing season. 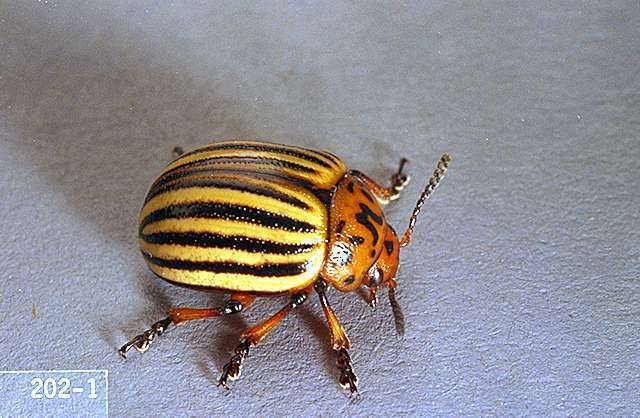 Pesticide resistance management The Colorado potato beetle is notorious for its ability to develop resistance rapidly to insecticides that are used repeatedly for control. 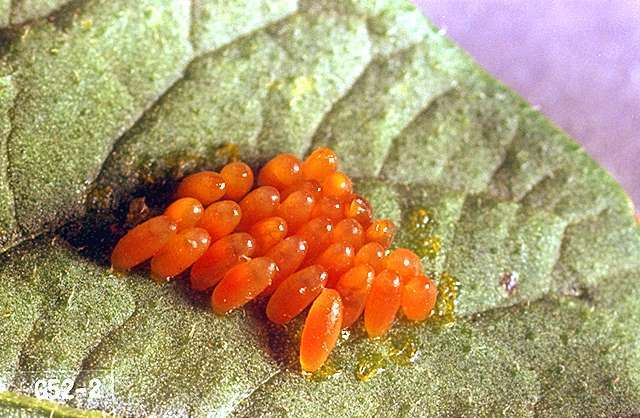 To delay or prevent resistance, it is important to rotate the insecticides used. Commercial strains of Bacillus thuringiensis tenebrionis (Btt) are effective and can be used as part of a rotation. 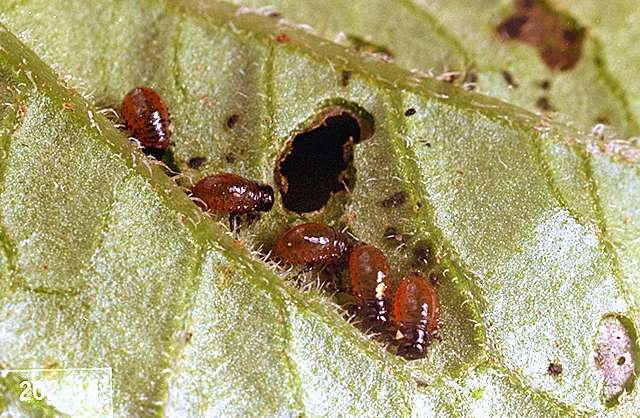 Manage Colorado potato beetle resistance field by field. While they may be resistant to one insecticide in a particular location, beetles in other areas within the same county may not have developed resistance to that insecticide.